Definition: The market in which the foreign currencies are bought and sold is called a Foreign Exchange Market. Here the buyers and sellers are involved in the sale and purchase of currencies of different countries. Spot Market: A spot market is the immediate delivery market, representing that segment of the foreign exchange market wherein the transactions (sale and purchase) of currency are settled within two days of the deal. That is, when the seller and buyer close their deal for currency within two days of the deal, is called as Spot Transaction. Thus, a spot market constitutes the spot sale and purchase of foreign exchange. The rate at which the transaction is settled is called a Spot Exchange Rate. It is the prevailing exchange rate in the market. 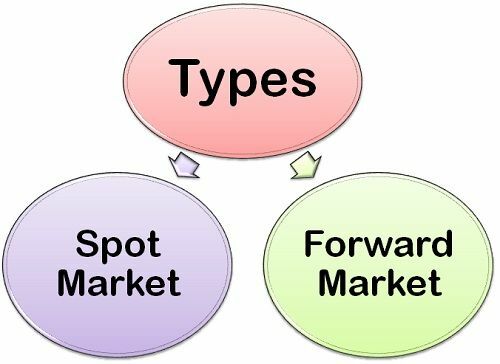 Forward Market: The forward exchange market refers to the transactions – sale and purchase of foreign exchange at some specified date in the future, usually after 90 days of the deal. That is, when the buyer and seller enter into a contract for the sale and purchase of foreign currency after 90 days of the deal at a fixed exchange rate agreed upon now, is called a Forward Transaction. Thus, the forward market constitutes the forward transactions in foreign exchange. The exchange rate at which the buyers or sellers settle the transactions in the forward market is called a Forward Exchange Rate. Thus, the spot and forward markets are the important kinds of foreign exchange market that often helps in stabilizing the foreign exchange rate. good definition foreign exchange market.